Our little guy is such a cruiser. He has pretty much toilet trained himself and already has dry pull-ups most day sleeps and even when he wakes some mornings. Honestly, we have done nothing. No books, no treats, no bribes. He just did it. And now, on night three of sleeping in his big boy bed, he's just so excited and not at all "OK cool, I'm getting out of this bed four million times after bedtime just to be cheeky". Nope, he just climbs in himself (very important part of the process, he says) and there he stays. I'm so proud of our little big boy. I didn't really think about the last sleep in his cot, in the cot that both our children have slept in. But I did sit quietly next to O on his first night in his new bed and thought "oh, my little boy has reached another milestone." I'm glad that had a sweet goodnight with O the night before. He had popped his hand out between his cot rails and waved, saying "good night, bye Mummy" a few times. Then when I lay him down for his day sleep on Saturday, he did it again. My heart swelled then, and even though I didn't conciously think about the fact that it was his last baby sleep in his cot, I breathed it in. I even went back in and watched him sleep. 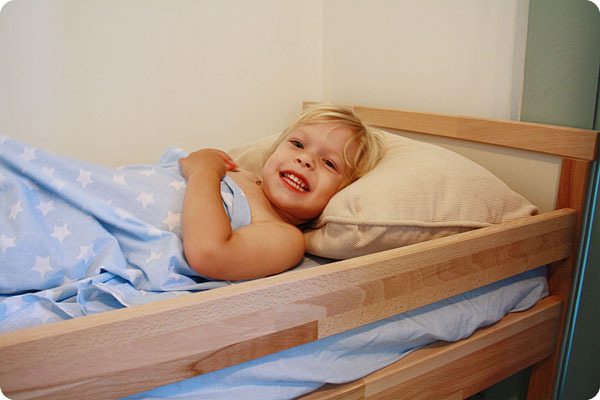 We ended up buying the Ikea Sniglar bed, which is a junior size bed. It's bigger than a cot and smaller than a regular single. O's room is an odd shape with French doors opening in to the room, a sliding glass door leading outside and a completely uneccesary angled wall. It really limits furniture placing and after measuring M's single bed, we realised it would be a tight squeeze if we went with a single. We had M test out this junior size in Ikea and we think she would last another two years in it in terms of length, so O should be OK in this little bed for quite a few years. It is perfect for him and he loves it - very important! This photo makes me laugh. He looks so boy here. Just out of bed. 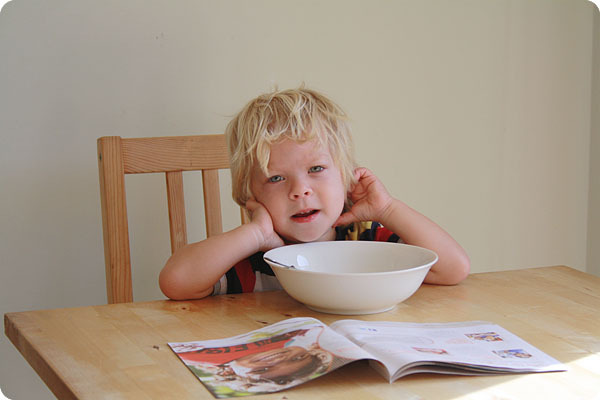 He's reading the World Vision Christmas catalogue and eating my muesli with yoghurt. Funny face boy. Love you so.